It pours out of the bottle a nice cloudy honey color with a large frothy white head that lingers and leaves a nice lacing in the glass. It smells of yeast with overtones of nuts and fruits. It tastes even better and for a hefe it will be one of my favorites while in Germany. It has a nice mouth that goes down smoothly. Murky yellowish-orange pour after adding in the sediment from the bottle. Thick, white head, that dissipates pretty quickly. Typical clove and banana but a little subdued. No noticeable hops. Flavor was lacking that sharp, tart, citrus aspect that I love about the style. A little too creamy on the palate. Not a bad hefeweizen, but not up there with the best German versions. It just didn't have that refreshing, effervescent quality. Had on-tap in Berlin, poured into a tall weiss glass. L: Pours a cloudy golden hue with ample head. Generous lacing. S: Bananas and spices, mild citrus and cloves. T/F: Pretty standard weiss. Yeasts and grains.. not an overpowering flavor. Slight citrus and mild banana. Decent carbonation. O: Another typical German weiss beer. Decent for hot weather or with a meal. Very clean/crisp with no real negatives.... or positives for that matter. L: Gives a cloudy light orange color. A big top of head that disolve very slow. Good lacings on the glass. T&F: starts of with a fruity sweetness, wheat,banana and some small citric notes. In the middle the spices get more dominant and cloves are very noticable.it finish of dry with a small bitterness in the aftertaste. The aftertaste disappear quite fast and sense a little to watery flavour in the end.the mouthfeel are crisp. O: a good and decent beer but lacks a little flavour to be a topshelf weisbier.easy to drink but a little anonymous. 11.2oz brown bottle with no freshness date. Very good, a bit too clean for my liking ... expected a bit more of the banana and clove but without those two pushing harder it is still a very drinkable brew. 500 ml bottle. Hazy golden colour, heavy that lingers less than others of the style, good lace. Smell of bananas, cloves, citrus. Medium to full body, again less than others, it feels good and the palate, easy to drink (again) than others, but some times it's an advantage. Taste of bananas (lingering), clove, wheat, citrus. I'd have it any day. This brew pours a cloudy orange with a fluffy white head, some of which sticks around until the end, lots of lacing and more carbonation than one would expect from a Hefeweizen. The smell is funky and wheaty with some orange and bananas. The taste is full of sweet wheat with a bit of a citric acid bite. The orange and banana taste dominate with the finish being slightly dry and giving you a second dose of citric acid bite. 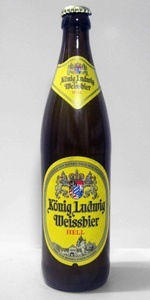 Overall this is a simple, easy to drink Hefeweizen which, according to the label, follows the Reinheitsgebot. An excellent, smooth weissbier. Grainy but just enough of the banana clove nuance. 500mL bottle, shared with my dad. Perfect pour for a German Hefeweizen: cloudy orangey-yellow with a towering white head that hods tremendous retention - just awesome. Aromas and flavors are typical for the style - yeast, wheat, clove, banana, faint bubblegum. Refreshing, but thinner bodied than some hefes. Nice clean finish. Overall, great example of the style, but I like some other brands a bit more than this one. Poured into a Celebrator pokal. Pours a hazy light to medium golden amber with a fine two finger white head with good retention and good lacing. Mild, but pleasant aroma of sweet bready malt, wheat and banana. Flavor follows with wheat, light yeast, banana and a hint of clove. Light bodied with pleasant carbonation. A nice, well made hefeweizen that does not stand out, but hits all the right notes and is mellow and tasty. A: The color is hazy orange and the enormous thick whipped-cream-like white head slowly dissipates into decent lacings. S: Malty, not too sweet, but richer in wheat - ripe bananas. Almost a bit dry. Cloves and lemons. Yeast. T: Sweet and bready - bananabread. Lots of wheat but not enough to overpower other flavours. Yeast. Citric. M: Aftertaste holds some bitterness. Body is light and carbonation rich but smooth. O: A nice Hefe, kind of mellow in comparison with the most extreme ones - nice! smooth, creamy head, not hoppy at all. lightly lemony with hint of banana esther, but no discernible spiceyness. no strange overtones or funkiness, just clean flavor in the biscuity sense; not overly carbonated. different from your average lager. Not bitter at all, and not sweet, either. Very refreshing. Like the first level of a Belgian tripel, but drinkable as a session beer... this isn't Hell, it's heaven!